May you always be blessed is the verse on this Irish angel garden statue. This standing Celtic cross for the garden features an Irish angel that is enhanced with green shamrocks. The Irish garden statue offers great detail with knot-work on the cross and a blessing on the pedestal; it is made of a stone and resin mix. 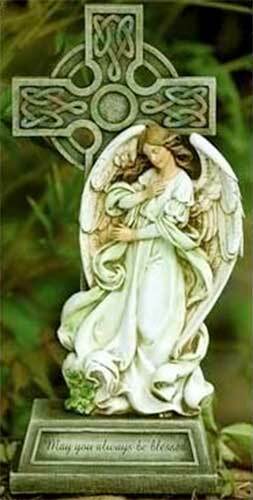 The Irish garden angel measures 7" wide x 14 3/4" tall x 3 1/4" deep and is suitable for outdoor use. The Irish angel is boxed with shamrock, Celtic knot and Celtic cross history cards, complements of The Irish Gift House.